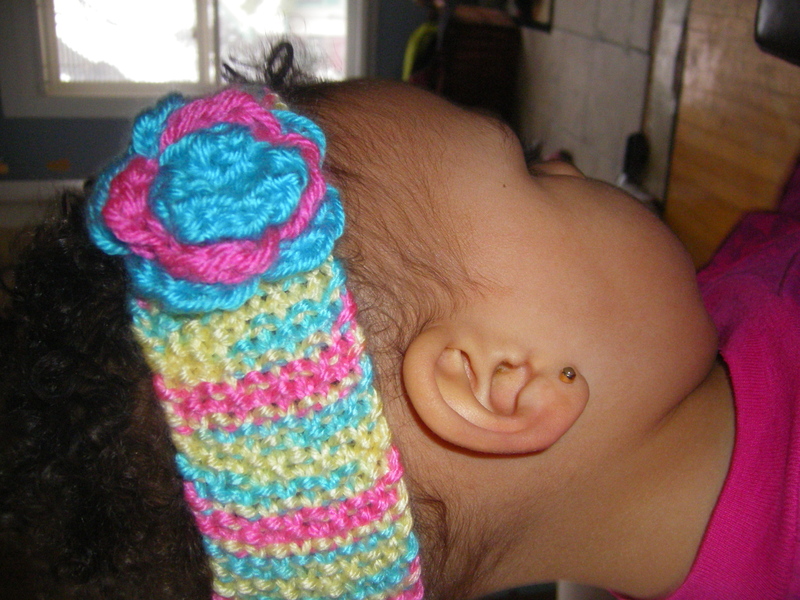 Here’s a simple pattern for a baby or toddler headband with a crocheted flower. 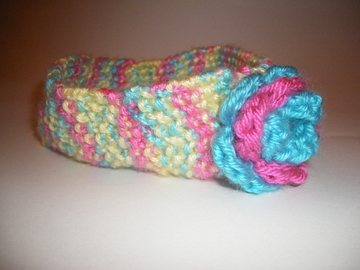 If you don’t knit or crochet, you can purchase this headband on my etsy site: www. etsy.com/shop/daisypatchdesigns for $15 US + shipping. Gauge is not really important. This is a great way to use up leftover yarn. On 4 mm needles, cast on an even number of stitches. I usually cast on from 6 to 10 stitches, depending on the wideness of the band I want to make. 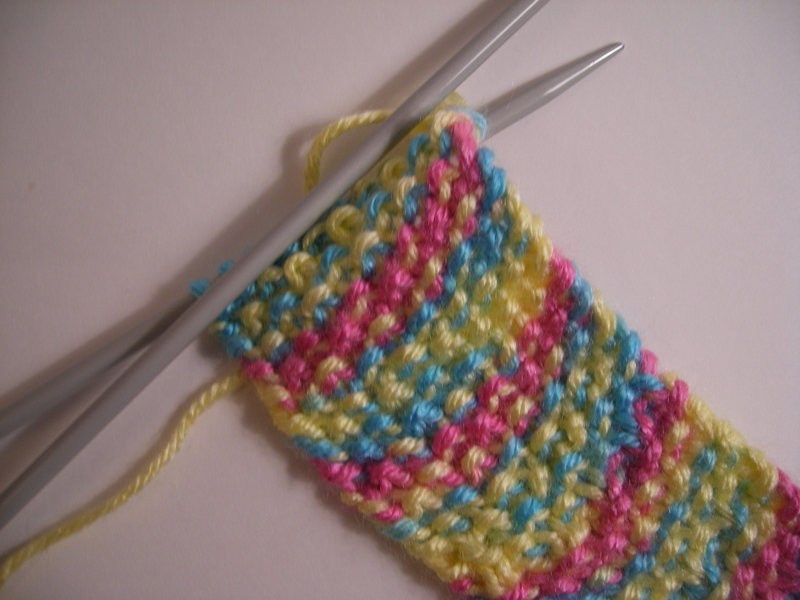 In the example, I cast on 10 stitches because I am making this for a toddler. Repeat these two rows until desired length is acheived. Depending on I usually stop about 1 inch or so shorter than the circumference of the child’s head. You are looking for a snug fit. Cast off and sew ends together. No need to weave in the ends right away, you can use the loose ends to secure the flowers in place. In this version, I made three different sized flowers that I stitched together. 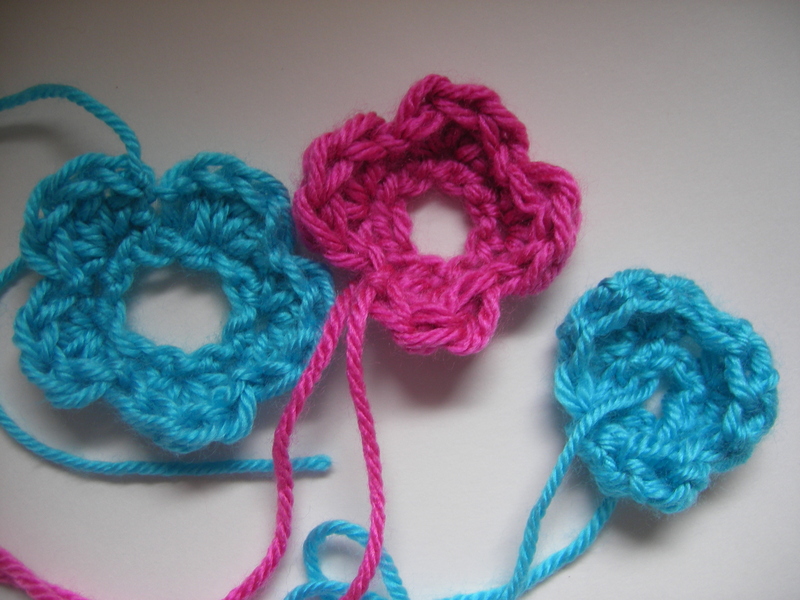 You could make a large flower and add a button in the middle or make a double flower. 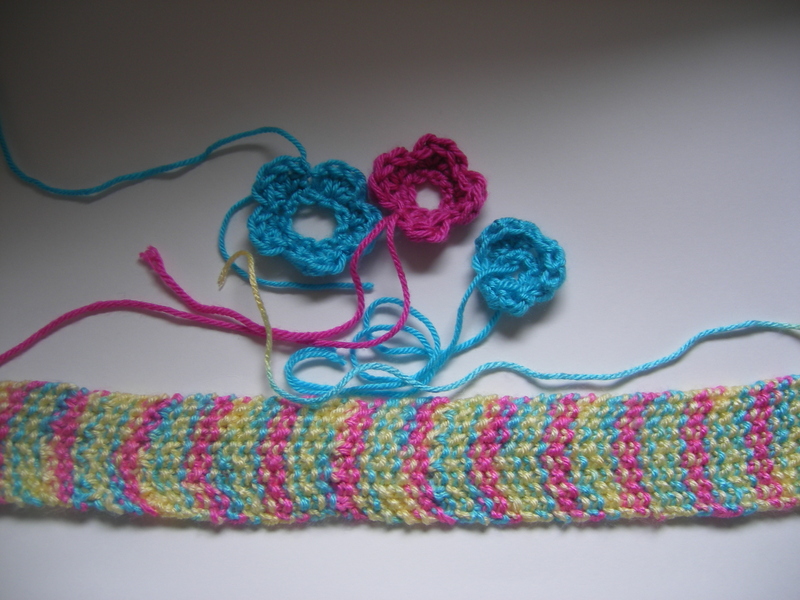 Using a 6.50 mm crochet hook, chain 6 and slip stitch into the first chain. Row 1: Single crochet all 6 stitches. Rox 2: Double crochet in first stitch after hook 3 times in the same stitch. 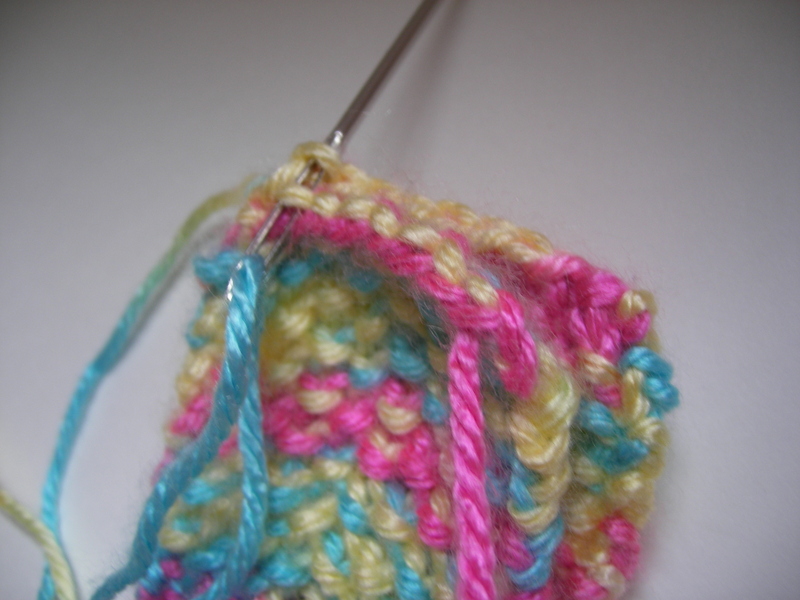 Slip stitch in the next stitch and repeat 2 more times ending with a slipstitch. Draw yarn through loop and break off. You should have three petals on this flower. Do the same as above but with a chain of 8 stitches. You should have 4 petals. Do the same as above with a chain of 12 stitches. You should have 5 petals. Starting with the large flower, sew the flower where the two ends of the headband were stitched together to hide the seam. 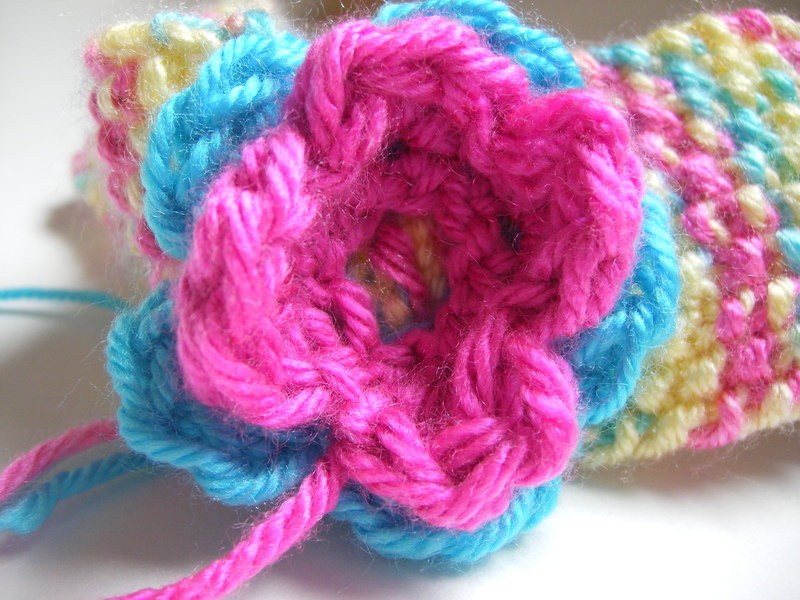 Sew through the middle of the flower, using the yarn in the middle to secure the flower in place. Place the medium flower in the large flower and secure in the same way. Do the same for the small flower. Weave in any loose ends.